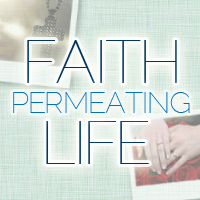 Since I changed my URL to faithpermeatinglife.com, if you are subscribed via RSS to my old URL it may take up to half a day for you to get my new posts. I suggest re-subscribing to the new URL if you want to see the posts as soon as they go up. This link should allow you to re-subscribe using Google Reader. I'm not sure what other RSS aggregators people use. I've also added the option of subscribing via e-mail. On the main site, just look for the "Subscribe By E-mail" box on the left side and enter your e-mail address.